Perhaps the best part about cruising with Royal Caribbean Cruise is the seemingly endless supply of food available from morning to late night. There are 2 main restaurants onboard – you can choose to have breakfast, lunch and dinner buffet-style in the Windjammer Cafe or have the meals served to your table in a fine-dining setting at Romeo & Juliet Restaurant. 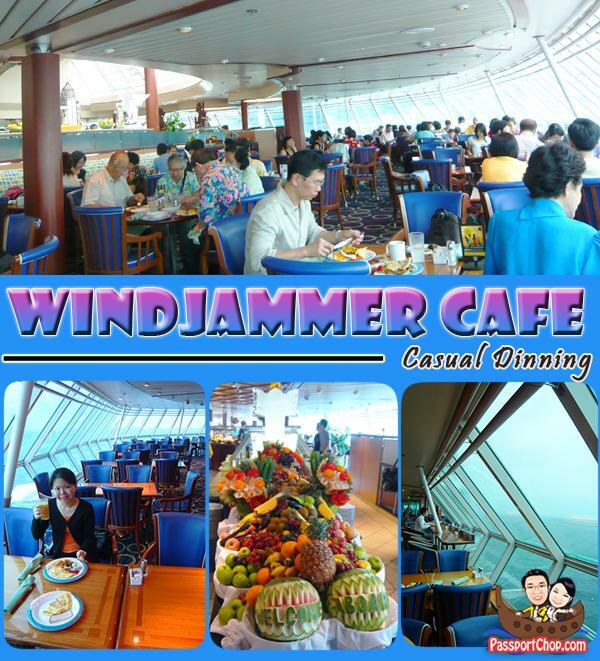 At the Windjammer Cafe, you will get a good view of the sea or a coastal city as you dine. The staff are very helpful and attentive – quick to clear unwanted plates. 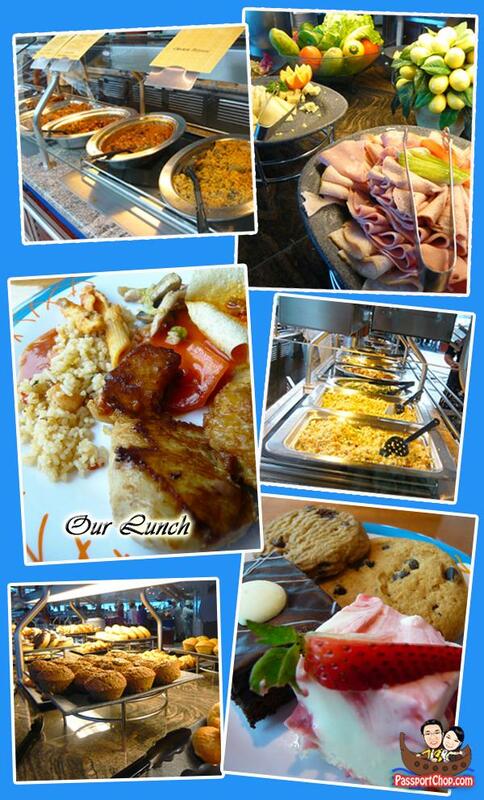 There is also a huge variety of food in the buffet so you will not get tired of eating them everyday. 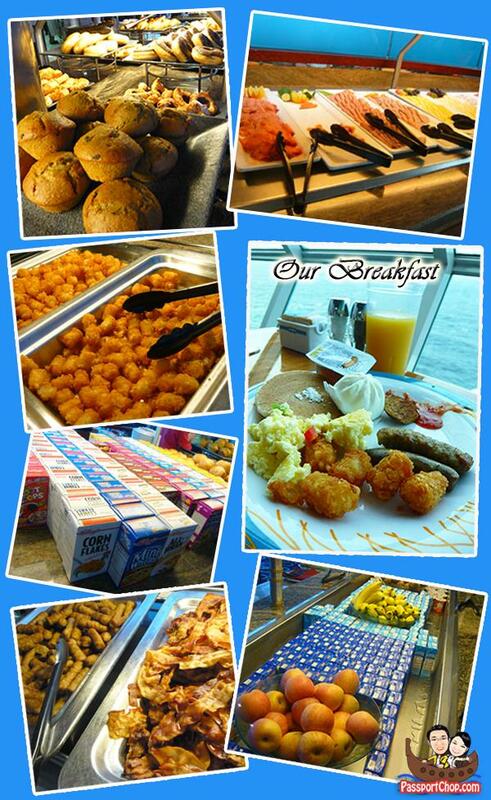 For breakfast, you can choose between full English-style (hashbrown, scrambled eggs etc.) or Continental-style (ham, cheese and various cold dishes) or even a mix of both. Simple breakfast mixes e.g. cereal with milk are also available. You can also request for omelettes with various fillings e.g. onions, cheese, ham, which are cooked on the spot by a chef. For lunch, you will get a mix of Asian and Western food e.g. honey-baked chicken and Chicken Briyani as well as a spread of various Indian food e.g. Thosai, Roti Prata. The desserts are the best part of this meal as you get to try Tiramisu, Strawberry-flavored cakes. However the cookies are a let-down as they tasted rather stale – signs of being left out in the open for too long; would be perfect if they could re-bake them to bring back the crispiness. .-= Gabriel´s last blog ..Cheese Cake =-. Hey We simply desired to let you, I really the actual composition on your own site. But I am using Group on the machine running version eight.x of Mac os x and the actual design aren’t quite satisfactory. Not really big offer, We will still fundamentally examine the posts and research for info, but just wanted to inform you regarding this. The navigation club is kind of hard to apply using config I’m running. Maintain the good work! This is my first time i visit right here. I found so many interesting stuff in your weblog particularly its discussion. From the tons of comments on your articles, I guess I am not the only one having all the enjoyment right here! keep up the great function.